A few months ago I accepted an invitation to speak to the Cascade Camera Club in Bend, Oregon. With my fall workshops behind me, I decided to take the opportunity to spend a few days exploring the Columbia River Gorge, a place long on my “must see” list. I wasn’t disappointed. Undeterred by steady rain throughout most of my visit, I found more photo opportunities than I had time to photograph. I’d only been there a couple of hours before it become clear that I’d be coming back, which caused me to change my strategy a bit. Rather than try to squeeze as many photographs as possible into my three days there, I decided to make my priority reconnaissance that would help me be more efficient on future trips. My emphasis was on waterfalls, something the Gorge has an ample selection of. I was also pleased to find vestiges of fall color, well past prime, but quite nice nevertheless. Though I spent most of my time familiarizing myself with the area, identifying locations and the best conditions for photographing them, I still managed to find plenty of photographs. The first waterfall I visited was Elowah Fall (about a one mile hike in a steady rain), where I was rewarded with a plethora of yellow leaves (some of which were still falling as I shot) accenting a tumbling cascade just downstream from the fall. Rather than follow the trail all the way to the bridge at the base of the fall, I scrambled about 75 feet down to McCord Creek for a perspective that would allow me to feature the leaves and cascades up close, with Elowah Fall in the background. When the hill turned out to be a little steeper than I’d anticipated, and the footing a bit slipperier, I had visions of myself reprising Michael Douglas and Kathleen Turner’s wild ride through the Columbian jungle in “Romancing the Stone.“ But I made it to the bottom unscathed (Galen Rowell I’m not), and proceeded to work this scene to within an inch of its life. I don’t think I moved more than fifteen feet from this spot for the hour or more I was there, starting atop a rock directly above the creek and eventually working myself down closer and closer, until I finally ended up standing in the water. Composing this was mostly a matter of organizing the leaves, rocks, and water into something coherent. 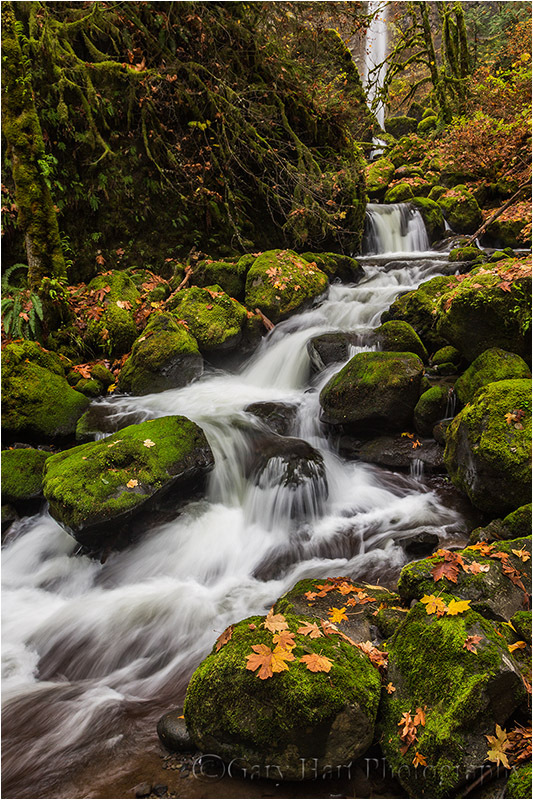 By going wide and vertical, I chose to make the leaves the prime focus point, using the creek to guide your eye to the fall itself. F16 ensured depth throughout the frame, while ISO 400 gave me a 1/3 second shutter speed in the limited light, slow enough to blur the water, but fast enough that the water maintained some character. My polarizer was turned to minimize reflections, allowing the color to come through the significant sheen on the wet leaves, rock, and moss, and on the surface of the dark water. I love this shot! I fell in love with Bend OR when I visited it many yrs ago-I had a nephew in school just outside Bend. I would definitely like to do a workshop out of that area of OR. I was in Bend when you posted this comment. It is indeed a great spot for a photographer. simply beautiful.. Thank you so much for sharing this. I love the photo and all the colors. So great to get the ‘behind the scenes’ of how this photo was created. so really good info.. I think this would be an excellent spot for a workshop! Really a very nice poster perfect image, I follow your blog regularly. Please try to post more images of Columbia river gorge.